At roughly noon, Microsoft's Joe Belfiore (Vice President for Windows Phone) announced via Twitter that users enrolled in the developer preview should check for updates. 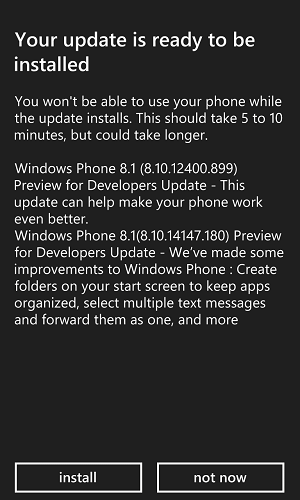 Microsoft released the Windows Phone 8.1 Update (GDR1) to test, develop against, and enjoy. And... if you're on the Developer Preview, go CHECK FOR UPDATES! WP8.1 Update is now live around the world! If you're not familiar with the preview for developers program, this is Microsoft's way of circumventing the lengthy update roll-out process. Windows Phone vendors (Nokia, HTC, Samsung, etc) first integrate the update with their software stack, send it to regional operators (AT&T, Rogers, etc), and finally the regional operators test, validate and deploy it. Microsoft likely calls it a developer preview to appease these partners, but considering it cost $0 and takes three minutes to sign up, its true role is quite obvious and tech enthusiasts appreciate it. To briefly recap, Microsoft described that Windows Phone 8.1 GDR1 will contain localization and Bluetooth improvements to Cortana, text messaging, mobile IE, enterprise app settings, and a unique approach to folders. I was particularly curious how the 'live folders' worked. At first I wasn't sure it was working, as the folder doesn't immediately update its tile after creation and instead waits for the contained tiles to update. Therefore, it can take a moment before any movement is seen. I've personally grown used to not having folders, but this implementation which maintains the live updates is appreciated. I was also curious what user agent string the web browser uses now. It is pretty funny seeing iPhone, Android, OS X, WebKit, Apple, Nokie, IE, Trident, the kitchen sink, you-name-it, all in one user agent. Microsoft stated that IE mobile was consistently served non-mobile pages by major web sites like Google and Twitter, so changing the user agent to a mobile catch-all is certainly one way to resolve that. No software update or Microsoft blog post ever seems to include a complete change list, so there are some extra user-visible improvements found in the update that were unexpected. VPN support previously included SSL VPN and IKEv2, and now grows to include L2TP with IPSec. Cellular data tethering now works over Bluetooth as well as WiFi. Microsoft posted a Windows Phone 8.1 GDR1 change list for OEMs that gives some insight into behind the scenes changes. Larger screen sizes (up to monster 7" devices) are now supported, along with a variety of new mid-tier resolutions. Microsoft added several Bluetooth improvements including higher fidelity audio and network audio video browsing through AVRCP. Dual SIM now supports C + G (CDMA + GSM). Finally, phone cover apps have new settings, although no interactive phone covers exist yet. Installed it last night and it works great! I am using a Lumia 920 with Black firmware and it is smooth as butter. Phone was getting slow with some of the minor updates of WP8.1, but it was easily fixed with a hard reset/reload of the OS. As annoyed as I am about WP hardware offerings on the highend, with no new hardware in sight until well into next year, I am super happy with how the newest software runs on my old 920. I mean, the device itself is coming up on 2 years old, and the platform is it based on is closer to 3 years old, but it keeps on kicking just fine! As for the update, it is mostly IE and Folders. Folders are great, and I think I have gone a little folder crazy with literally everything on my app list being in a folder on the main screen now, we will find out soon if that will become an issue with so many live tiles as I know previous versions of WP were limited to a fairly small number of live tiles before they would stop updating, and that many updates may ping the CPU too much to allow for proper sleep times. But at least I can find all of my apps! And as things like OneNote pages and web pages can be linked separately it is great to have the stand-alone app, and then a folder full of quick links right next to it! IE is MUCH improved! on WP8 IE had issues, but most of them were pretty easy to work around, and as things like adverts were broken which was sort of like having AB+ pre-installed on my device. But sites like Amazon and ebay simply didn't work. Then came WP8.1; with that the layout of websites was much more accurate, but it still wasn't right. Advertisements started working... but with no way to close them. Layouts mostly worked... but sometimes scrolling side-to-side would not work. It was technically better, but functionally a step backwards. But the new update seems to fix a lot of that. Sites that were forcing me to use mobile when I prefer the desktop layout now respect my selection. Sites (and adverts) are formatted correctly which make pages navigateable. Sites like Amazon which have never worked on WP, now work perfectly. Still annoying on some sites to not have Flash or Silverlight support, but that is to be expected, and thankfully those are loosing support as time which makes them less of a problem. I was hoping that the online version of Word, Excel, PPT, etc. would work well with the new mobile IE as a way to get a better/updated office suite for the phone; but sadly when you select to start a new document or template from the website it just opens the apps. Still, when selecting the new document you can see the word website displayed properly behind the selection, so maybe we will see it work before long, or the much needed update based on the website running directly on the phone.